The greatest wildlife show on earth is about to arrive on your PC. Africa is the last continent on earth to hold on to its ‘megafauna’ – the really big stuff like elephants, rhinos and herds of antelope tens thousands strong - and it’s hanging on to them by the skin on its teeth. Here at the MAPA Project, we’re making sure that no one can say “We never knew!” when it comes to keeping African parks and wildlife in the public eye. MAPA stands for ‘Mapping Africa’s Protected Areas’ and so far we’ve plotted the major parks, reserves, and protected areas for Southern and East Africa. Check them out on Google Earth and watch epic wildlife video snippets or just find out about places you didn’t even know existed. Download the MAPA layer and find out just how extraordinary our continent is. 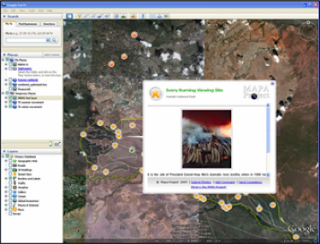 You can also find the layer in the Google Earth Outreach Showcase. What’s the largest mammal migration on earth? You’d probably guess the wildebeest migration in East Africa with over a million wildebeest and zebra on the move every year. Well, it may be the heaviest one, but what about the two million fruit bats which gather in Kasanka National Park in Zambia every November and fly off every evening, darkening the sky for twenty minutes? Nobody knows why they all go there, but go they do – and you can too. It’s a work-in-progress and we have thousands more parks, blog posts, research projects and icons to get up but we are really on our way now. We plan to be at it for another couple of years but if you need to know anything about conservation in Africa, start here and you will end up in the right place. 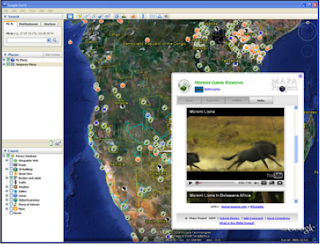 Conservationists and GIS enthusiasts all across Africa are helping us to pull this groundbreaking project together. You can too: each park and reserve on the map tells its story and each links to websites with even more info. Bloggers are welcome on the layer and over fifty are already keeping us posted with what they are doing for conservation. Have you ever wondered what happens to all those tracks that researchers download from satellite collars on the National Geographic channel? Well we did too, so we’re looking for them and we’ve already put a couple online for you to unravel, with plenty more to come. So, if you are considering traveling in Africa, if you need some really credible background to that news story or school project, or if you just know the value of something that is irreplaceable, load this layer and watch what Africa is doing to conserve its priceless environmental legacy. For more information on how to get involved, visit www.mapaproject.org.